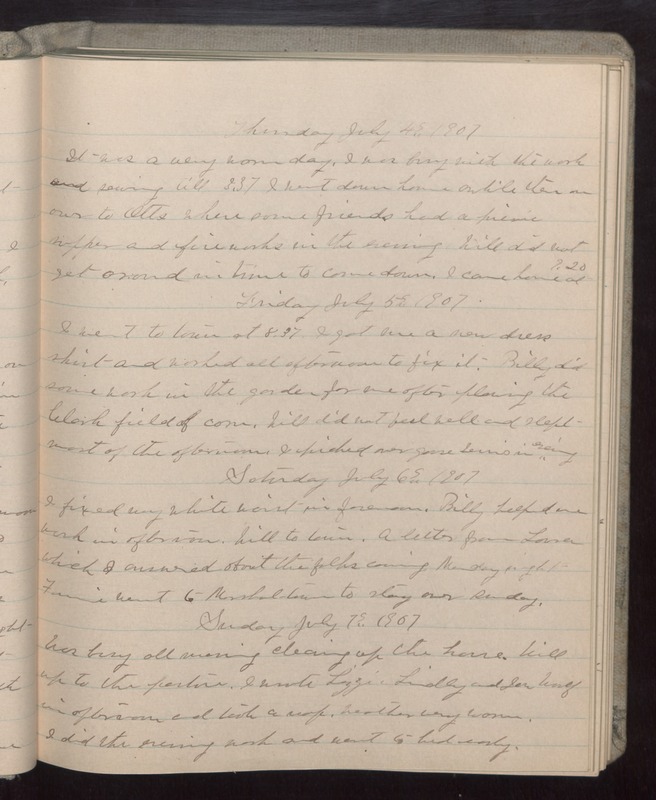 Thursday July 4 1907 It was a very warm day. I was busy with the work and sewing till 3.37 I went down home awhile then on over to Otts where some friends had a picnic supper and fireworks in the evening. Will did not get [around?] in time to come down. I came home at 7.20 Friday July 5 1907 I went to town at 8.37. I got me a new dress skirt and worked all afternoon to fix it. Billy did some work in the garden for me after plowing the Clark field of corn. Will did not feel well and slept most of the afternoon. I picked over gooseberries in evening. Saturday July 6 1907 I fixed my white waist in forenoon. Billy helped me work in afternoon. Will to town. A letter from Lorna which I answered about the folks coming Monday night Fannie went to [Marshaltown?] to stay over Sunday. Sunday July 7 1907 Was busy all morning cleaning up the house. Will up to the pasture. I wrote Lizzie Lindley and Joe Woolf in afternoon and took a nap. Weather very warm. I did the evening work and went to bed early.